Facebook Updates While Driving? C’mon! General Motors’ OnStar division has developed a system that provides drivers the ability to record audio updates that could be posted to a user’s Facebook page. The system would also allow drivers to hear their friends’ status updates read to them by a computerized voice. OnStar says the idea reflects society’s growing desire to be connected at all times. What could possibly be so urgent to post or read on Facebook that it would require a driver’s immediate attention? Research from the University of Utah found that distraction from cell phone use while driving (hand held or hands free) extends a driver’s reaction as much as having a blood alcohol concentration at the legal limit of .08 percent. I’d need to see some hard data to convince me that the distraction level wouldn’t be similar for those listening to posts or adding their own posts on a Facebook page. If we accept the argument of ‘people will do it anyway’, why don’t we apply it to speeding, drinking while driving, and drag racing on residential streets? Why not enable drivers to take these dangerous actions – ‘with safety in mind’? I get OnStar’s motivation – if nothing else, the deployment of this service should boost their core business of responding to accidents. GM isn’t the only auto manufacturer going down the distraction path. Ford Motor Co.’s Sync system, available in 2011 Ford and Lincoln models, is very similar. Besides allowing drivers to hear and reply to text messages, Ford’s system also allows drivers to interact with cell phone apps for things like Internet radio and Twitter. Opponents of these technologies point to the existing body of evidence to say these systems will lead to greater driver distraction, but Ford has a different point of view. They believe that systems like these allow drivers to do things they’re already doing anyway, such as checking text messages, while keeping their eyes on the road. Hmm. Does Facebooking while driving qualify as a distraction under this definition? Following OnStar and Ford’s assertion, your eyes and hand would only have to be off the road for a tiny moment – and we don’t hear recommendations urging a ban on pushing a button to change your radio station…. But there’s that last pesky cognitive point about taking your mind off driving and focusing attention on Facebook, that’s the deal breaker. To learn more about distracted driving, see my blog post Distracted Driving? Take the Distractology 101 Learning Challenge. GM’s OnStar team is also testing a system which would allow drivers to hear text messages read to them by the “OnStar Virtual Advisor” computerized voice. By pressing a button on the steering wheel, drivers would also be able to reply using one of four pre-written responses. The only message your car should be sharing with you is “keep your focus on the road”. WebSafety’s development team has a strong law enforcement and prosecutorial background. This is both a strength and a weakness. While they’ve been ‘in the trenches’ to know the issues, their solutions are heavy handed. To be clear, any company in the business of providing protection services to consumers has to first overcome one hurdle – convincing people that they need protection. However, how a company goes about making that business case can vary dramatically. Neither the cellular nor the online worlds are dangerous; instead some elements within these have risks, and those risks range from low to high probability of occurrence and low to high potential consequences. Our jobs as individuals and parents is to assess these risks as they relate to our own, or our children’s, unique circumstances and take appropriate measures. Fear messaging makes choosing appropriate measures more, rather than less, complicated and these messages therefore do more harm than good. 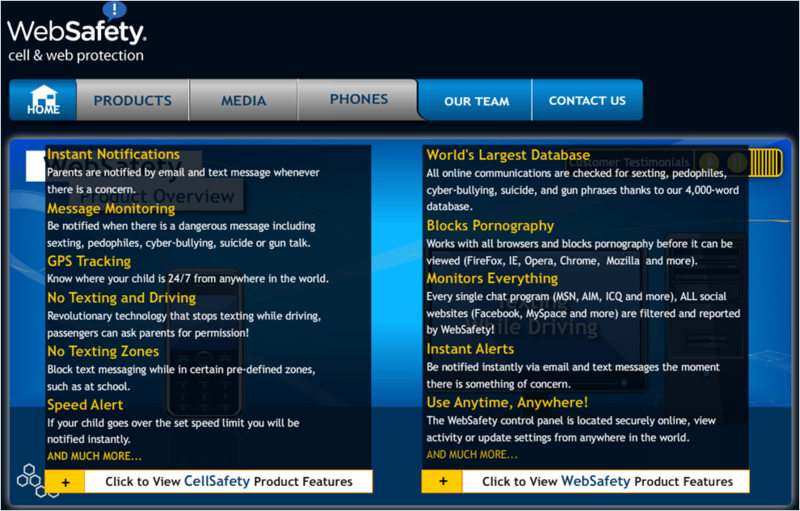 I am concerned about the lack of real information about the company’s CellSafety product. Beyond their dropdown bullet points (shown below), I can’t find any information that let’s me understand how these services work, what level of management I have over each feature, what level of transparency about the monitoring is provided to youth (and, keep in mind these could be used against a spouse, an ex- or other person as easily as against a child) – or even what “AND MUCH MORE…..” is. There is no material about discussing safe texting with kids, or any educational material whatsoever. 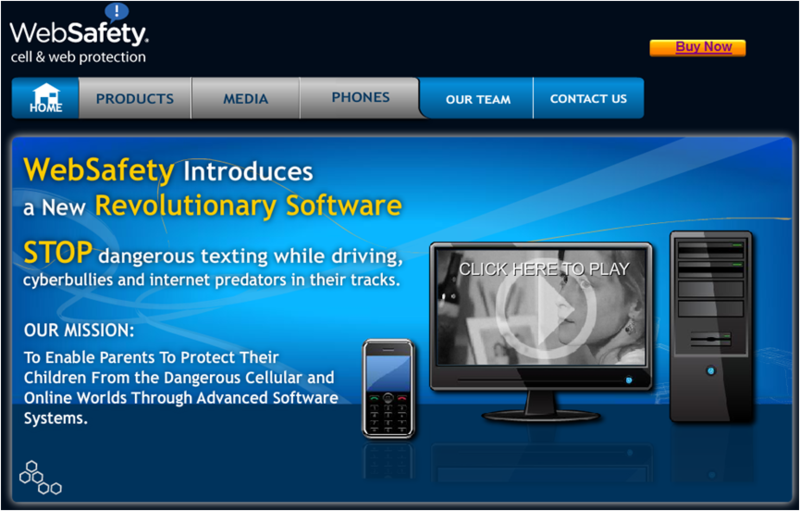 Their CellSafety Product: In a press release, CellSafety said it “uses proprietary technology to electronically detect when a car is moving at speeds above 10mph and prohibits the driver’s ability to send or read text and email messages or utilize the phone web browser.” In their bullet list they say “passengers can ask parents for permission!” presumably to override the automatic blocking of passengers ability to text, as all that can be detected by their product is that a phone is in a moving car, not whether the person trying to text is the driver. What about legitimate cases where the passenger is using the driver’s phone? Blocking that could put the users at risk. What stops the driver from using a passengers unblocked phone? What happens if the passenger can’t contact their parent to get permission? CellSafety also claims they can “ensure that a driver’s eyes are on the road and off their phone”. Really? People surf and read email when driving. No outside element can ensure where the driver’s eyes are – or aren’t. And while I’m strongly against texting while driving, (see below for blogs I’ve written on this topic) I think we’ve lost sight that ANY form of distracted driving is wrong. Should we get an product that will stop someone from applying mascara while driving, shaving while driving, yelling at kids in the back seat while driving, or being drunk off their rocker while driving? The company mixes statistics in a manner that is sloppy, and misleading. In the same press release about their CellSafety product designed to block texting while driving, WebSafety states that “Distracted driving is one of the most serious, life-threatening practices on our nation’s roadways with almost 8,000 crashes related to distracted driving occurring daily in the United States.” I assume this is a true statement, but that is not a statistic about texting while driving – the problem they propose to solve – it’s a statistic about ALL distracted driving. This statistical blurring continues with their CEO Rowland Day stating “Consumers mistakenly believe they will not be the victim of, or responsible for, a distracted driving incident which is why the CellSafety application is so vital in order to stop the deadly social obsession of texting-while-driving.” Again, the implication is that all distracted driving is texting when driving, and we all know that isn’t the case. The CellSafety mobile application “also includes additional features which inhibit texting in school via “No Texting Zones” in order to prevent scholastic cheating as well as notifications in real-time if users are sending or receiving inappropriate text messages.” There is nothing wrong with a kid texting while at school; in fact there are very legitimate reasons for doing so. Cheating is wrong. Texting when you should be participating is wrong. But texting during lunch? Texting your mother about after school plans? Getting a text from your father about where he’s going to pick you up from? Sending your mom a reminder to bring your soccer shoes? What I see is a product that is more designed to ‘catch’ than to educate kids. That hasn’t gotten past the sledgehammer approach to blocking, filtering and reporting to design meaningful services that create constructive, collaborative safety environments for families. I think the intent behind the company and their services is good, the execution is lacking.